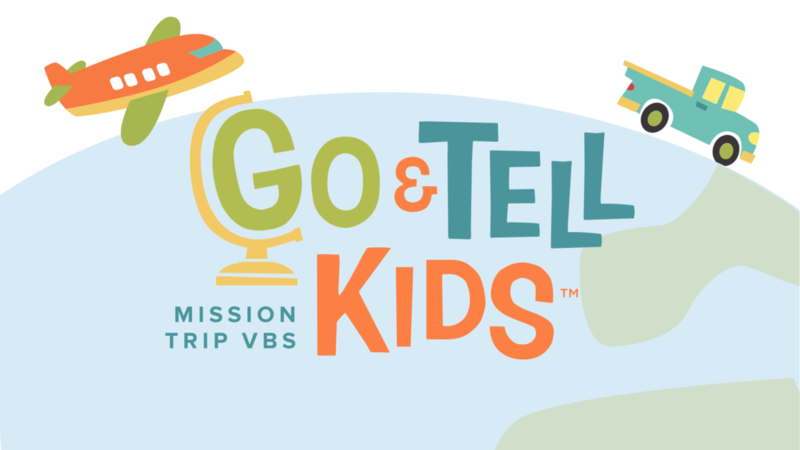 Go & Tell Kids is a 5-session resource designed to help you share the gospel wherever you gather with a group of kids. It’s theme-less (so you don’t have to drag a bunch of stuff with you halfway around the world) and stripped of uniquely America cultural references, games, snacks, etc. (so that it is relevant to kids in any culture and any setting). If you want to add a theme—go for it! But it works perfectly well without one. Fans of Galactic Starveyors may recognize the Bible content, as it uses the same “gospel 101” outline to trace God’s redemptive plan from creation to Christ. There are five 30-minute Bible study sessions for children (broadly-graded) and five 30-minute Bible-teaching sessions for preschoolers (broadly-graded). A self-standing, pop-out easel features large Bible story pictures (large enough to use even with a BIG group of kids) with the Bible story for both preschoolers and older kids on the back, game boards, an interactive gospel presentation, and other large group visuals. All of the teaching plans are conveniently located on a flash drive. Print or email teaching plans to your team and you won’t have any bulky guides taking up room in your suitcase. And don’t worry about losing the flash drive … we’ve given you a digital pass so that you’ll still have access to all of the files—even if you lose the flash drive! And that’s not all that’s on the flash drive! There are over 100 game ideas because, let’s face it, the best way to draw kids in (even with a language barrier) is play. So we’ve given you PLENTY of options! You’ll also find preschool and children’s crafts, coloring pages, director’s helps, and even a large group Rally Time with skits. All of this comes packaged inside a handy little backpack that is perfect for packing. It fits easily in a suitcase and gives you a place to keep all of your construction paper, glue sticks, markers, and other supplies together. 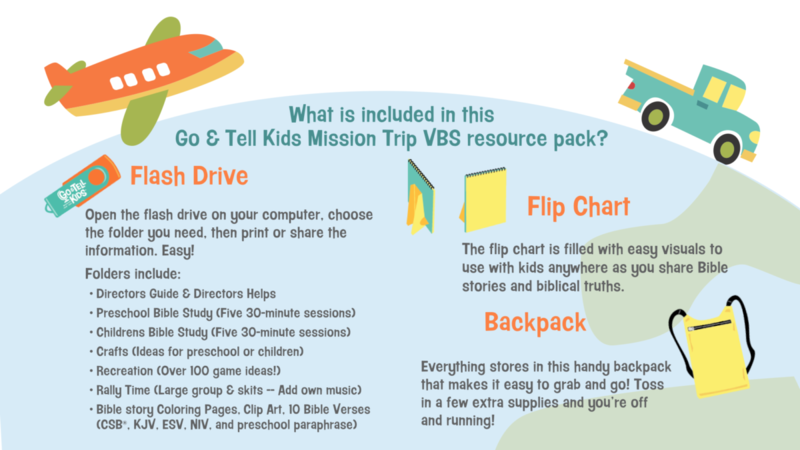 That’s another reason why Go & Tell Kids is a perfect mission trip resource! You can also purchase Go & Tell Kids as a 100% digital resource without ever leaving the comfort of your own home. You’ll get EVERYTHING that comes in the version that sits on the bookstore shelves EXCEPT the handy backpack. Click here to learn more. Can someone tell me the dimensions of the banners that were used for the stage decorations at the Ridgecrest Preview? Any information would be appreciated because my training for our association is March 24!